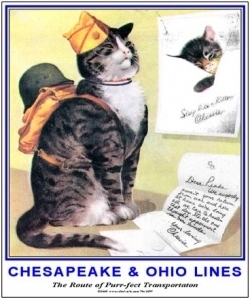 Chesapeake and Ohio Railroad was home to Chessie the railroad kitten and Peake, Chessies tom cat. 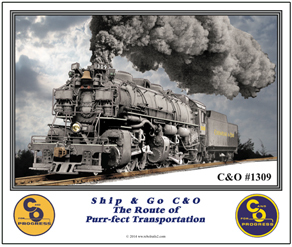 The C&O is now part of the CSX Railroad. C&O has an aggressive historical society that you should look into joining. 1869-1987 Individual marks are licensed marks owned by CSX Railroad Company and are used under an active license agreement. The C&O Railroads articulated #1309 steamer will soon be riding the rails of the Western Maryland Scenic Railroad in Cumberland, Maryland. She is being restored for tourist operation. Feel the heat. A beautiful new tee featuring the classic C&O corporate logo with name spelled out below the logo in unique C&O script. 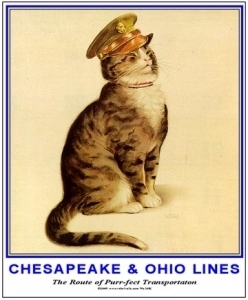 Chessie the railroad kitten and her kittens sleeping in berth #9 on the C&O Railroad. Husband Peake looks over his Family. 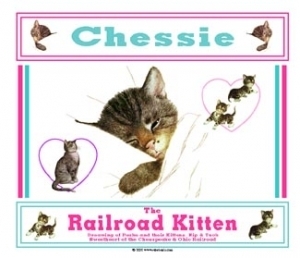 Chessie the railroad kitten dreaming about her tomcat Peake and their kittens, Nip and Tuck. PINK now available in every size including 3XL and 5XL. 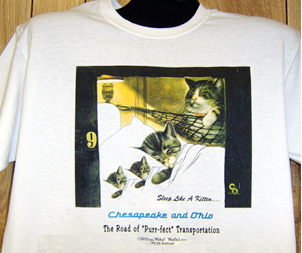 The C&O Railroads Chessie the Railroad Kitten featured in her classic "broken plate" logo. 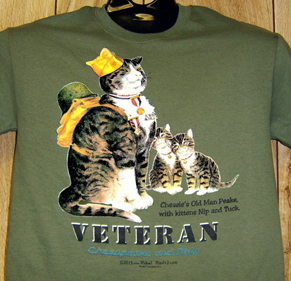 NEW t-shirt featuring a splendid image of Chessie's tom cat Peake as a WWII Veteran with kittens Nip & Tuck looking on. 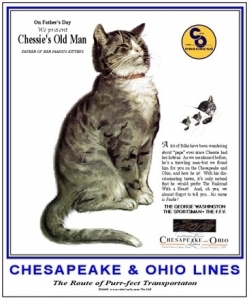 Chessie and Peake and their family played a big role in the C&O Railroads advertising in the 1930s and 1940's. War time sign with an Allegheny steam locomotive rushing down the Chessie Corridor with World War II supplies for our military around the world. 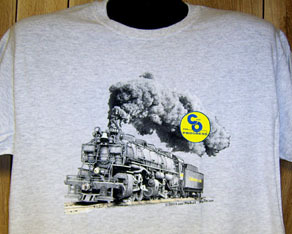 Without America's Railroads we might still be fighting WWII. 6 inch x 6 inch square tin sign of the C&O Railways Chessie and Turbine design used on luggage tags and other advertisements. 6 inch x 6 inch square tin FFV, Fast Flying Virginian logo sign of the C&O Railroad. 6 inch x 6 inch square tin logo sign of the Chesapeake & Ohio Railroad. 6 inch x 6 inch square tin logo sign of a logo used by the C&O Railroad. 6 inch x 6 inch square tin The Sportsman logo sign of the Chesapeake & Ohio Railroad. 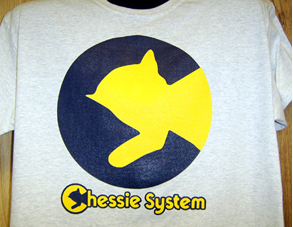 6 inch x 6 inch square tin logo sign of the Chessie System. The Chesapeake & Ohio Railroads #1309 will soon be pulling folks on the Western Maryland Scenic Railroad in Cumberland, Maryland. She is being restored there for tourist operation. 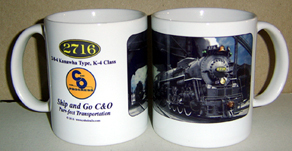 Coffee Mug featuring the powerful and swift Chesapeake & Ohio Railroads 2-8-4 number 2716, a Kanawha Type, K-4 Class steamer. 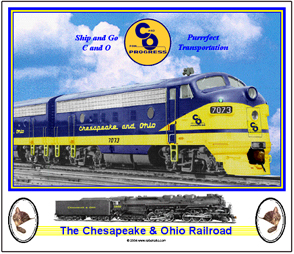 The Chesapeake & Ohio Railroad operated a huge fleet of F-unit diesels. 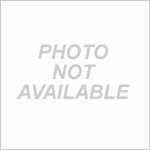 This mug features a builders photo of brand new F9 A&B units. 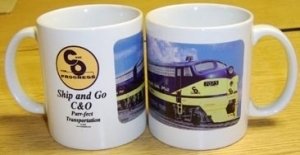 Mug features the C&O for Progress logo over the color scheme of its diesel locomotives. Chessie and her family mug. Chessie, tom cat Peake and kittens Nip and Tuck. Chessie and her family. Chessie in lace with her tom cat Peake and kittens Nip and Tuck. Chessie asleep in a heart on a C&O passenger train. Sleeping like a kitting and arriving fresh as a Daisy. 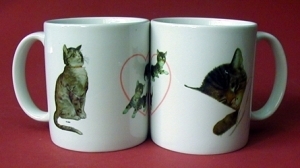 Stunning coffee mug featuring Chessie's tom cat Peake as a WWII Veteran, with kittens Nip and Tuck looking on. Classic C&O Logo adorns this license plate along with the tag line.... Ship & Go C&O! 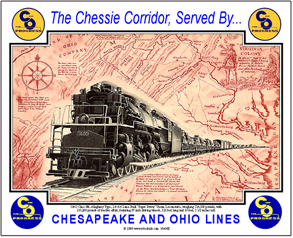 The Chesapeake & Ohio Railroad is well represented by a very active historical society. Pad features image of C&O railroads steam #1309, being restored at Western Maryland Scenic Railroad. 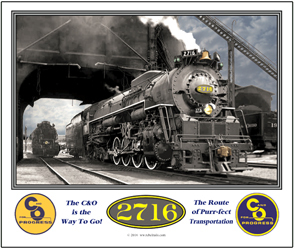 Mouse pad features the classic Chesapeake & Ohio Railroads swift and powerful 2-8-4 Kanawha Type, K-4 Class steam locomotive number 2716. Pad features builders photo of new F-7 A and B unit diesels in low wave paint scheme. Chessie & Family Mouse Pad with her tom cat Peake and kittens Nip and Tuck. Chessie appears to be dreaming about her family. 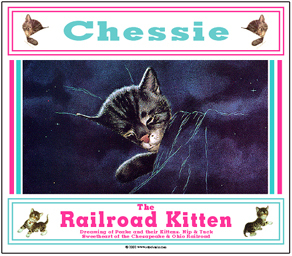 Pad features a beautiful night time image of Chessie the railroad kitten. 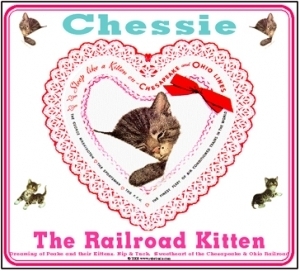 Chessie the railroad kitten in a beautiful lace heart motif. A very unique mouse pad. Your mouse will not be afraid of this kitten! 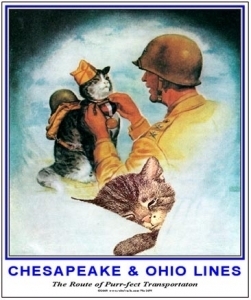 Exceptional image of Chessie's tom cat Peake as a WWII Veteran, with kittens Nip and Tuck looking on. Tin sign featuring greetings from Chessie. A unique sign of an historic railroad icon. 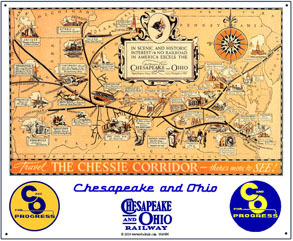 Chessie Corridor map of the Chesapeake & Ohio Railroad promoting all of the exciting and historic places along it line.... Theres more to see on the Chessie Corridor. 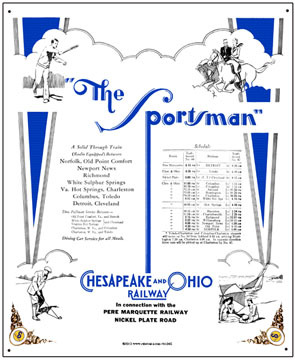 Reproduction and enhanced Chesapeake and Ohio railroad ad regarding its Sportsman passenger train operation. 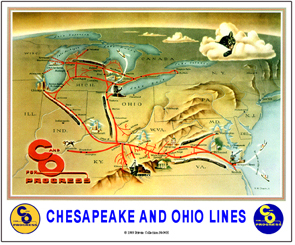 System map of the Chesapeake & Ohio Railroad. 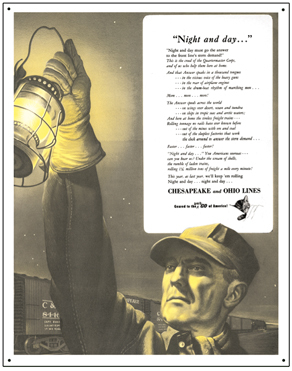 Advertisement ran during World War II by the Chesapeake & Ohio Railroad alerting the public that the C&O was on duty night & day for the American War effort. Map of the Chessie Corridor and all of its many scenic and historic sites along the line. 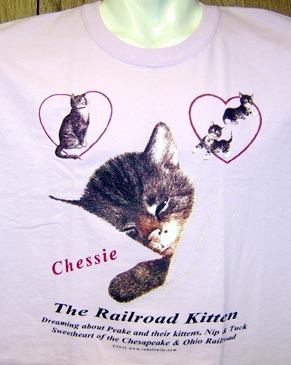 Tin sign of Chessie the railroad kitten, dreaming of her husband Peake, off fighting for freedom in a far away county. 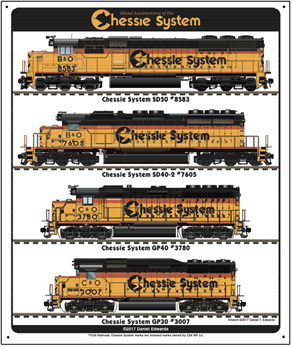 Artist Daniel Edwards rendition of Diesels of the Chessie System. 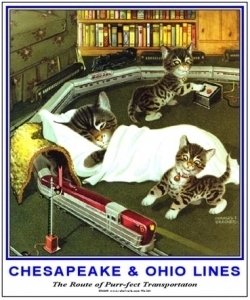 Tin sign of kittens Nip and Tuck playing with a new C&O model passenger train while Chessie sleeps like a kitten! 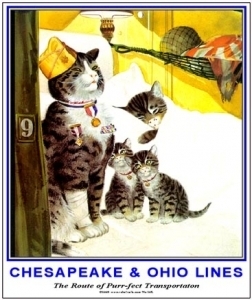 Tin sign of Peake, Chessie and family heading home on a Chesapeake & Ohio Railroad train. The War is over and Peake has many awards pinned to his chest. Note the enemy flag. 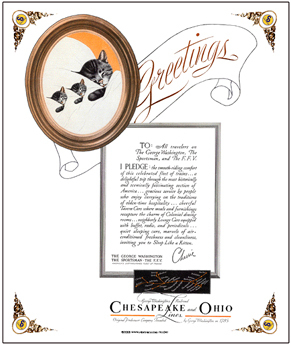 Tin sign of the Chesapeake & Ohio Railroads introduction of Chessies Husband PEAKE just in time for Fathers Day. 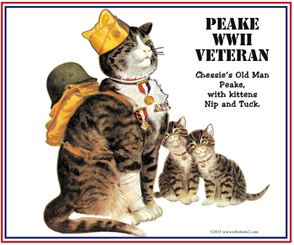 Tin sign of Peake, Chessies husband, joining the Army in World War II. Tin sign of Peake reading a letter from home during his wartime stint in the Army. Notice the pin-up picture of Chessie.